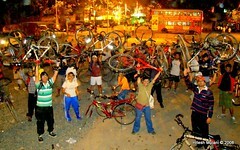 What a superb Critical Mass in Mumbai on 27th Dec 08. Can be called as the first CM officially because the first was done in 2001 by group of college students, but then not one bothered of doing it again. So after 7 years CM has been started in Mumbai again. This will continue every last Saturday of the Month at Shivaji Park so be there. Altogether 46 Cyclist were present for the ride. Was accepting some where between 60 to 100 cyclists. Half of them were fresh face. Please do come for the next CM. (don't disappear). However because of festive season most of them didn't turn up. Never the less, ride was successful. We started at 5:45 pm because of Media. And also a group of college students had come, who work with a NGO Pukar. They came to take down some pointers from cyclists. They are collecting data and will be coordinating again with us. We reached Juhu in about a hour's time. Very impressive ride. Lot of young and energetic faces. Please maintain the same energy and momentum. We have to achieve lot of things in Mumbai for cyclists. There was no causalities luckily or any kind of accidents. Some thing we learned from the ride. Some where just going a head and some were way behind. So the motive of CM was lost. We are also planning to make some small banners which can be hooked on to T-Shirt or Bag. So that we are notice on roads.